I agree with the article – I think leaving things to politicians when they have a vested interest in the outcome is necessarily a bad idea. Some kind of independent commission of inquiry needs to be set up in order to monitor and control the situation. India’s economy is doing relatively well, just imagine how well it could be doing if corruption is under control. 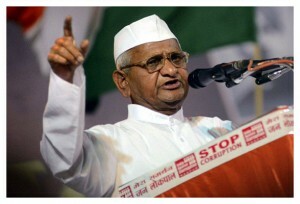 I find these Indian corruption statistics appalling – it’s no wonder people like Anna Hazare need to make a stand. One can only hope that political parties stop condoning corruption by their inaction – personally I am not optimistic at all. The problem is the system that Allows this sort of thing to go on. These must be some law in place that will bring any act of corruption to court.